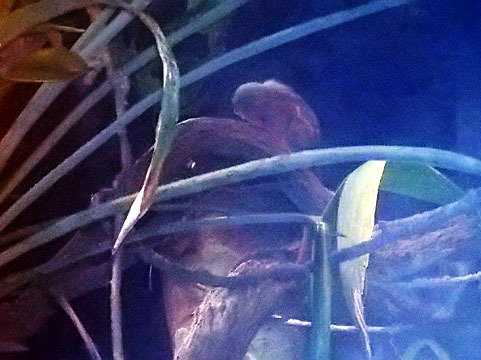 Debauched sloth at the National Aquarium. Okay, he's probably not really debauched, just sleeping. 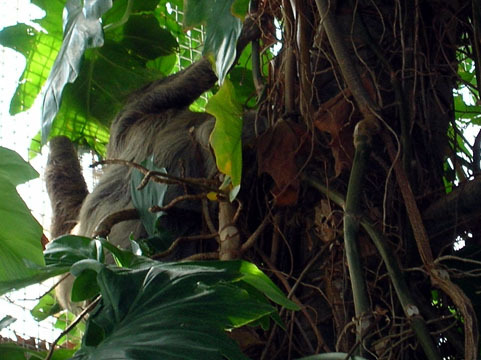 But this is the first time we saw all the mammals in the rainforest -- the sloth, tamarins and mice -- as well as numerous birds and of course the pirhanas, turtles, etc. We had intended to visit only briefly after seeing the HMS Bounty, to get drinks and walk down from the rainforest through the shark tanks. But the dolphin shows were cancelled because Nani had a calf two weeks ago and needed peace and quiet, and because of this the auditorium was open for people to wander in and watch the dolphins just hanging out and playing with the trainers who were swimming with them, playing ball with them and chatting with visitors in a way that rarely happens in the crowded aquarium when shows are going on. 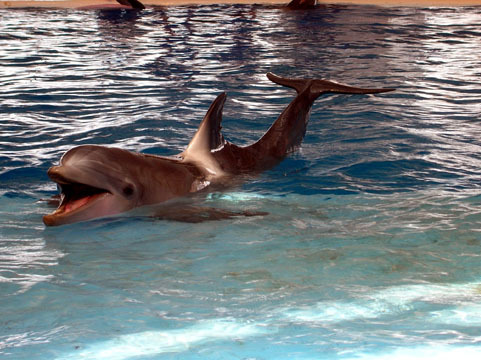 And here is Spirit, who was born at the aquarium in 2001, making chatty noises and rolling around at the front of the pool nearest the stairs, while one of the other dolphins was taking spontaneous runs around the tank and splashing the trainers in the well. 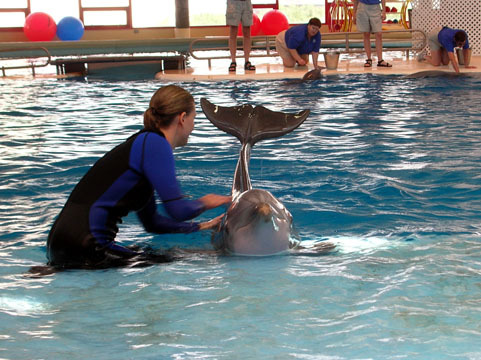 One of the 2004 dolphin babies was killed by agitated older male dolphins, so they are being very careful with the new calf until everyone has settled down, but some of them were being hams. 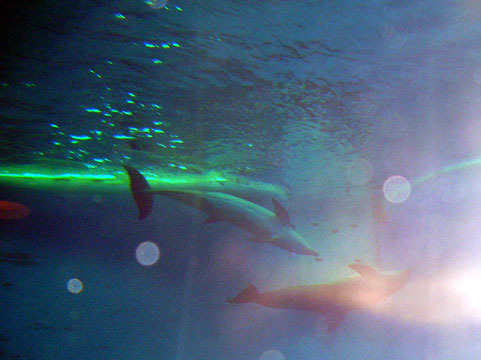 A photo badly marred by reflections off a glass tank, but you can see how playful they are with each other. 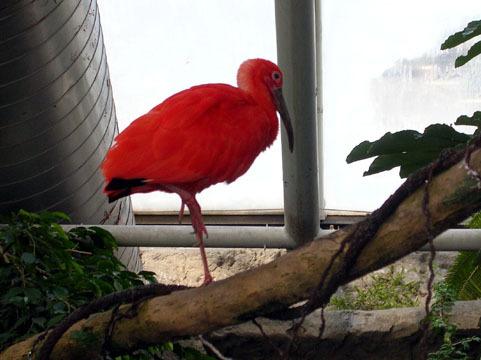 A scarlet ibis posing on a brach in the rainforest, which is the uppermost floor of the central building; the lower floors contain a huge ray pool, Atlantic and Chesapeake tanks and the giant walk-through coral reef and shark tanks, while the attached building contains the dolphins, touch pool and snack bar. The new Australia building will open in the fall. 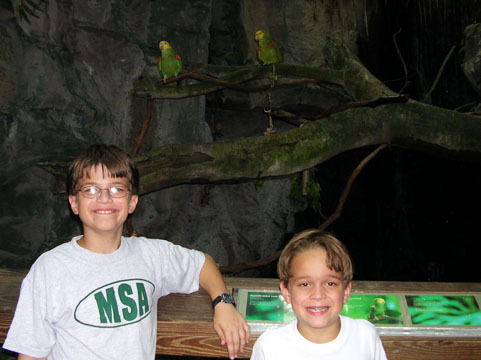 Many birds were cooperative about posing in the rainforest! 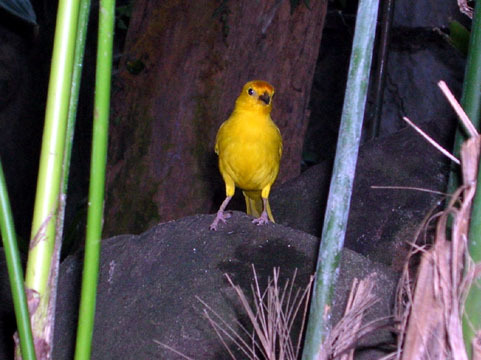 This is a saffron finch. 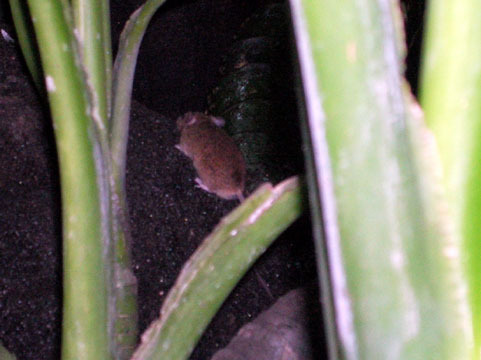 ...and some kind of mouse, which we are hoping was part of the permanent exhibit and not someone's dinner. A pygmy marmoset in the small Brazil exhibit downstairs. It was behind glass, hence the glare, but this is the most clearly we have ever seen one at the aquarium. 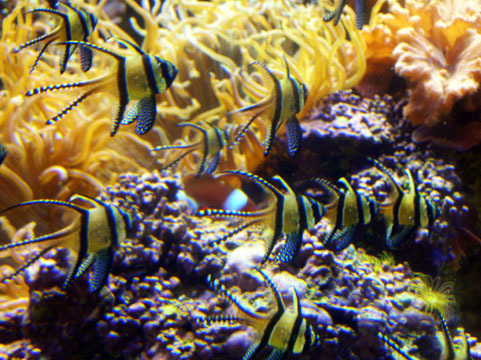 Yellow fish and anemone in the coral reef exhibit. 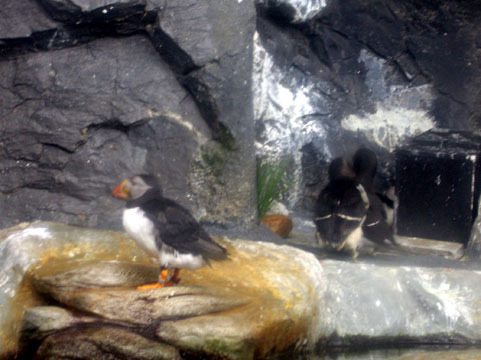 The North Atlantic seabird exhibit, behind glass that was heavily steamed up and covered with water droplets, hence the blur. 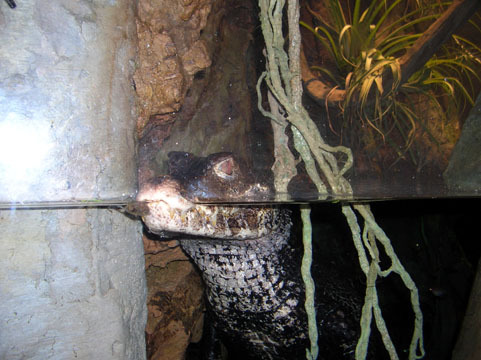 A caiman in the Brazilian rainforest exhibit. 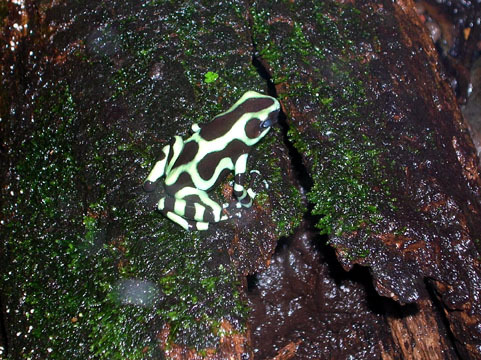 A poison dart frog. There were a whole variety of colors, blue and yellow and orange, plus an enormous spider and a viper in these tanks. 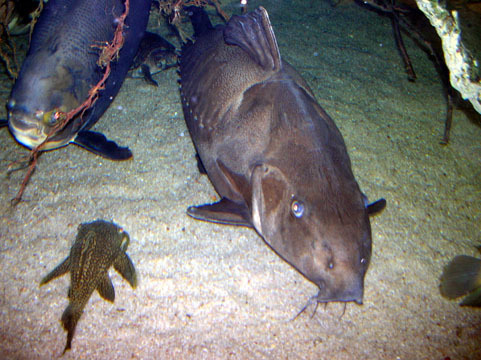 And oh, yeah, some fish. We liked these because they looked like they were stuffed -- you can see the stitches on their sides!